It is my life long dream to learn enough Chinese to read the ‘Legend of the Condor Heroes’ or 射雕英雄传 in its original language and it was one of the main reasons why I wrote my Chinese English Dictionary application. Now that I’ve switched over to to an OS X machine I wanted to continue using it. Fortunately I used Java to write the software and a quick build using NetBeans created a suitable enough jar to run. Unfortunately it looked a bit ugly and I couldn’t start it up like a normal OS X application. After some Googling, I was pleasantly surprised that Apple bundles with a neat Jar Bundler that creates a nice OS X interface for the desktop application. I spiffed up the icons using Icon Composer (also bundled in) and created my first OS X desktop application. You can find both Jar Bundler and Icon Composer in /Developer/Applications/Java Tools under your main disk. So for OS X users out there who wants a simple, easy to use and effective Chinese English Dictionary to be your companion while learning Chinese, you can download the full OS X application from here. I tried JRuby for the first time in small project listed in my previous blog entry. While I wouldn’t say it’s love at first sight (or first use), it intrigued me sufficiently to try out other usages of JRuby. What is JRuby? If you just think it this way — the Ruby that you and I know and love is a C implementation of the Ruby programming language — then JRuby is quite easy to understand. JRuby is the Java implementation of the Ruby programming language. What the major difference and advantage in JRuby is that you’ll be able to define and interact with Java classes in Ruby directly. And that’s it. It’s not really different from Ruby, except that some built-in classes are not supported. And if you look at it from another angle, it’s not really that different between doing it this way (using JRuby) and using WIN32API or WIN32OLE, except of course you’ll need to know all the Java nuances and quirks. Enter JRuby on Rails. Why JRuby on Rails? I think anyone who has done Java and Rails would be able to answer this one. It’s simply the vast ocean of Java libraries available, both good and bad, that gives JRuby on Rails the appeal for me. No doubt, the ‘enterprise’ factor of Java EE (i.e. running on a Java EE app server like Glassfish or the likes) is pretty appealing to those who care but I would say it’s not really worth it (at least at this point in time). I was quite impressed with the demos done with JRuby and Glassfishv2 during JavaOne so I thought to give it a run to see what happens. The results are not too bad, although not everything works smoothly. For the current status of Rails support in JRuby click here. Let me run through quickly how you can deploy a JRuby on Rails application on Apache Tomcat 6. Why Tomcat? While there are a growing number of Java EE application servers out there, Tomcat is probably the one that most Java EE programmers cut their teeth and is most familiar with. 1. You’ll need to install JRuby. Installation is quite easy, just download the latest package from http://dist.codehaus.org/jruby/ and then unzip it into any directory. 2. Now set the environment variable JRUBY_HOME to point to this directory and set your path to point to JRUBY_HOME/bin. If you’re doing this all the time you should set this permanently. irb(main):002:0> frame = javax.swing.JFrame.new "JRuby Frame"
JRuby will automatically install the necessary rails gems. 7. Now, you can create or take your existing rails application and add the Rails-Integration plugin. The tasks are pretty self explanatory. 9. There are a couple of things you need to change in the Rails configuration itself to enable Rails to run properly under a Java EE application server so you need to go into the config directory now. This will enable you to use ActiveRecord-JDBC. There are a couple of configurations given on other tutorials but this is the one that works for me. 11. Now open up database.yml to configure the database connection. Remember to change both the development and production. You can point them to the same database, but right now, the Rails-Integration will redirect to the production database once you archive your application into a WAR. In this example, I’m using MySQL but you can use any JDBC URL to connect to any JDBC enabled database. If you can’t generate, go back and check out steps 9 – 11. Also to note is that you’re running Java as well, so check your classpath if you are missing the JDBC drivers for your database. And try it out quickly to ensure it works. Browse around the code until you find a place to put this line. This will create the WAR file by archiving your code and any libraries needed to run JRuby. The first time you run it might take a while and you’ll need to be connected to the Internet in order for Maven to bring in the Java libraries from its public repository but subsequently it’ll be much faster. A problem I faced earlier on is that while getting some libraries, the connection will expire and creation is aborted. I had to run it a few times before it completes properly. 16. You’re done! You now have a WAR file that wil run on Tomcat 6 or Glassfishv2 (I tried both). Just deploy them normally as you would any web application. Some time back (more than 4 years ago) I experimented with Craig Reynold’s boids concept. I suppose everyone does boids some time or another. I called mine Utopia and wrote a simple simulation game around it, where two groups of opposing boids clashed with each other, try to eat each other up. Macabre, I know but it was pretty cool. I was reading The Origin of Wealth by Eric Beinhocker recently. One of the chapters described Epstein and Axtell’s research in Sugarscape and it reminded me of Utopia. I thought why not to try reproduce it with some of what I did in Utopia but in Ruby? After some initial hiccups trying to find the best GUI toolkit to create Utopia2, I decided to use JRuby and Swing. A bit of background on the subject matter. Joshua Epstein and Robert Axtell are researchers in the Brookings Institution, a public policy think-tank in US. The Sugarscape project was basically an attempt to use ideas from complexity theory and artificial life on to the social sciences. The goal is to see if behaviours we see in real societies can be modelled using just simple local rules, very much like the three basic rules used in modelling boids. Sugarscape simulates the behavior of artificial people (agents) located on a landscape (50 x 50 grid) of a generalized resource (sugar, hence Sugarscape). Agents are born onto the Sugarscape with a vision, a metabolism, a speed, and other genetic attributes. Their movement is governed by a simple local rule: “look around as far as you can; find the spot with the most sugar; go there and eat the sugar.” Every time an agent moves, it burns sugar at an amount equal to its metabolic rate. Agents die if and when they burn up all their sugar. Sugar is distributed unevenly in Sugarscape, some cells have higher concentration of sugar while others have lower and two sugar ‘mountains’ are formed at the top right and bottom left of the simulation. Sugar that is consumed is also grown back at the rate of one per unit of time, so the food never really runs out. The simulation starts with 250 agents started at random places. The diagram below shows the output of the basic model, from Epstein and Axtell’s research. Besides this, in Utopia2 while food grows back, it doesn’t do so immediately but grows back at a different rate. The result is as shown in this YouTube clip. Here are some still shots of the simulation and two charts that trace the the progress of the simulation. 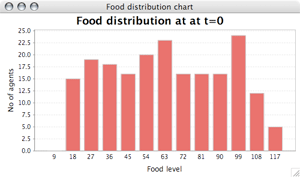 The first chart shows the food level of each alf over the progression of the simulation. 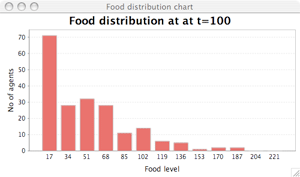 In t=0, the alfs’ food levels are evenly distributed, that is, some have more food than the others but overall, the gap is not large. 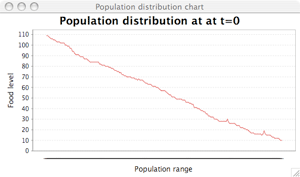 As the simulation progresses, you’ll notice that the chart becomes a sort of power law graph, where there are some alfs with a lot of food, while most will eventually have either very little or none (dead). 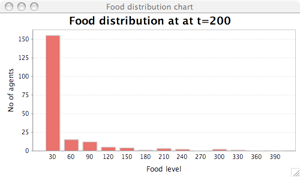 The second chart shows the number of alfs compared with the amount of food (in ranges) it has. I took the food levels of all the alfs, and divided the difference between the most food with the least food with a 13 different ranges or food ‘bins’. Then I sorted the alfs accordingly into each bin. In t=0, the distribution, as expected is quite even, and it forms a sort of uneven bell curve. This is expected as the initial food levels of the alfs is a random distribution. However, as the simulation progresses you’ll notice the chart starts to skew towards the left, with few very ‘rich’ alfs with a lot of food to the right, a long tail of ‘middle class’ alfs and a lot of alfs with little or no food (dead). In fact, in certain simulations, while the alfs start of with a random food level of between 0 – 100, the super-rich alfs can reach levels of more than 7,000! You’re right if you notice that these two charts basically potray the same thing, and in fact it is the same results that Epstein and Axtell came up with from their Sugarscape model. So what does Epstein and Axtell’s research show? In 1895, Italian economist Vilfredo Pareto collected income data from a number of countries and created a distribution chart called the Pareto distribution. Rather than a bell-shaped curve, which it will be if it is a normal distribution, it was one with a few very rich people, a wide range of middle class people and a large number of poor people, what is sometimes also known as power law distribution. In fact you’d probably have heard of this one before – this is the 80-20 rule, where 20% of the people owns 80% of the wealth. And the Sugarscape (and Utopia2) simulation model shows this. However if we dig deeper, both answers are not right, because in each case the distribution is random and therefore bell-curve distribution, if these are the reasons then the final distribution of wealth should also be bell-curve. The real answer, apparently is described in complexity theory. 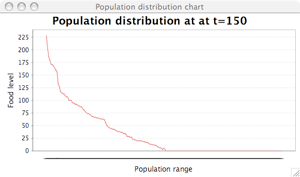 The skewed Pareto distribution we see is an emergent property of the system, and not because of a single cause. Without going in depth, what it means is that from a simple set of rules rises a new complexity that cannot be easily derived from the existing set of rules. If we apply it to the real world, the parallels can be that there is no single easy cause of why the rich gets richer and the poor gets poorer, not only because of oppressive explotation by the rich, or globalization, or protectionist policies or the laziness of the people or the color of the skin or whichever the cause of the day is. If you want to try out Utopia2, I’m making it available here, under Apache 2 license. You’re free to take it up and do whatever pleases you, but I’d appreciate it if you reference me if you do use it. You’ll need JRuby, of course, and JFreeChart. By the way, this model of the Sugarscape simulation that I have just described is just the basic model. The full work done by Epstein and Axtell is described in their 1996 book Growing Artificial Societies: social science from the bottom up from MIT Press. Utopia2’s implementation to date follows this basic model only, however it is really quite simple to program the other more complex models. Let me know if you use Utopia2 to do this, I’ll be interested in knowing how you do it. So the final day has arrived and as in previous years, JavaOne ended on a rather quiet and subdued note. The general session on the last day was by James Gosling (for those uninitiated, the ‘Father of Java’) and his session was called ‘The Toy Show’. It featured a whirlwind of 12 demos aimed to display the wide range and variety of uses in the industry, from meat weighing machines to toy robots to terrain scanning helicopters. It was a pretty interesting session which highlighted the extended reach Java have in all aspects of software development today, though I dare say that this is really nothing compared to the reach C has in the market. The only interesting technical session (at least in my opinion) that followed was the one on Java ME data binding by Sun Microsystems. I missed the earlier one where a new flashier UI using SVG was discussed but nonetheless, it was quite interesting how much further Java ME is going to go in the coming months and years. I met up with Watt after that and he brought me across the Golden Gate Bridge to Sausalito for dinner where we had California styled sushi, which for the record tastes nothing like the Japanese food I have so often in Singapore. I’ll be heading back to sunny Singapore tomorrow with a tired body but fresh new ideas and technologies. It was a good trip all in all. Today’s sessions were a mixed bunch. I started off with a rather droning session in the morning, coupled with a strong accent from the presenter (I think he’s from Russia or some Eastern European country) and the late night last night made me drowse off half the session on object-oriented databases in Java ME. I feel rather guilty on this because this is a rather useful utility that is open sourced under GPL. The session that got me awake and interested was the one on JavaFX Script, previously known as F3 (Form Follows Function), the much talked about new technology from Sun. It really isn’t Java the programming language per se, it’s a totally different new programming language, as Chris Oliver, its inventor explained, but one running on the Java platform. Although it’s called a JavaFX Script, it’s not really a scripting language either. Confused? I think most people would be, considering that it just came out a couple of days ago and it’s inventor claims that it’s already a misnomer. Anyway, the ultimate aim for JavaFX Script was to be compiled into bytecodes and not as it is today interpreted by a JavaFX interpreter. It is also supposed to be ultimately deployed on the browser through the Java Platform (today it’ll be the Java Plugin) althought right now it’ll run only on the desktop or through Java Web Start (there’s a cool calculator at Chris Oliver’s blog that uses this). The concepts are pretty interesting — it’s took the idea of a component based GUI toolkit (like Swing), peppered it heavily with influences from SVG and delivered it as a full programming language that is statically typed to allow a developer to create very compelling UIs. So what does it have that others don’t already have? Frankly speaking I have no idea. If anything I thought Actionscript already does something like this in Flash and I’d imagine Silverlight would have too though I’m unfamiliar with either. From the session and the Q&A subsequently what I gathered is that there probably isn’t anything else other than making the developer more efficient and effective. Another interesting session that I attended was on data mining. In fact I just got to know that there was a JSR-73 that was for data mining in Java. I went for it as I was mighty curious on data mining (after the several report related issues in office recently) and I was quite surprised at the complexity and sophistication in this domain. In fact many of the things which I have never thought was related to data mining, was related to data mining. For example one of the things I took for granted was ‘cross selling’, which is to say, if you buy beer, it could be a good idea to try to sell you chips as well (e.g. in put them together in a supermarket) as it has a very high chance of success. There is in fact a data mining method called Market Basket Analysis which provides algorithms to do this. Very cool. I also attended a session on BD-J, that is, writing Java applications on the Blue-Ray disc. This is mostly revolving around writing the startup menus and other add-ons like games and such for DVD releases, though I can imagine other things can be done on it in the future once it’s properly released. I thought it was pretty cool as well though it’s way out of my domain (mostly it’s for studios and production houses — one of the speakers who was sharing experiences was from Disney). After soaking up tech stuff for most of the day, I went for the After Dark Bash and it was quite a circus sideshow. The first thing that greeted me when I went in was a mini-concert by a group of ‘vertically-challenged’ entertainers. That is to say, they were a bunch of dwarf singers decked out like KISS (the heavy metal group) belting out heavy metal songs. There were various kinds of food and drinks (two drinks coupons per person) like burger, hotdogs, popcorn, beer, wine, soft drinks and the like and the whole hall was turned into a massive entertainment center with pinball machines, XBoxes, mini-inverse bungees and even a section for people to try out Segways. But the main attraction was probably the Battlebots arena where there was an exhibition tournment where robots battle it out in very rough conditions trying to smash each other up to scrap metal. Very cool and I suppose very American as well. During an intermission, there was even a totally wierd ‘performance’ by Grindergirl, who came into the ring with a grinder and proceeded to create sparks by running the grinder over her metal-covered body very seductively. There was a collective groan when she moved the grinder over her crotch and created sparks that shot out seemingly from her nether regions. Have to see to believe. This will be a short post. I’m tired, it’s almost 3am and I have another full day tomorrow (not to mention the After-Dark Bash, which I look forward to, since I’ve not been to one in the previous years). Today’s session for me have been filled with JavaCard related technical talks and one on software as a service (SaaS) with an experimental Sun project called Project Caroline. As you can see, it will have both ‘classic’ APDU protocol as well as the new ‘connected’ HTTP/S protocol stack. However there are lots of questions still unanswered. I took my usual picture with Duke. Life is sometimes a funny thing. The first day of JavaOne proper began with a lesson in crowd control. I haven’t been in a conference of this kind of size for a long while, but the management of the crowds and generally the coordination of the conference attendees and speakers are right on target. Attendees were ushered along with brisk efficiency and had friendly (mostly) Moscone Center staff manning the area showing the way or giving directions with confidence and a quick nod or smile. After a quick bite at the breakfast counter, I rushed to join the long snaking queue to go into the first keynote/general session. This year, as always, the general sessions was hosted by John Gage. However the first keynote was by Rich Green, Executive VP of Software in Sun Microsystems. As Rich Green started his session with flair and great finesse, he began to troop one partner after another on stage to give announcements on partnerships. Executives from companies such as Ericsson, Nasdaq, Sony, Yahoo! and even the United Nations(!) joined in the Java lovefest. As I sat there listening to the fanfare, laser light-show and blasting rock music (Paul Harriman, the Ericsson executive called it a ‘Java rock concert’) I came to a realization that Java rightly owed its current pole position largely to Sun Microsystems. With 6 million developers, it is the currently most popular programming language and has been so for the past 3 years. Large companies put lots of money into Java and business people generally believe Java strongly at many levels, from the Java Card smart cards running in hundred of millions of SIM and EMV cards around the world, to hundreds of millions of Java ME enabled mobile phones and the countless Java EE server applications that run at the the backend of large enterprises. For another programming language or platform to overtake Java it would be a mamoth task without the backing of an organization like Sun. But today Sun wanted to fight on a different level. It wanted to slug it out in the rich application client arena currently dominated by Adobe Flash, with a recent tentative entry by Microsoft in the form of its Silverlight offering and Adobe’s new Flex offering. The Web 2.0, of course, has also it’s current king of the hill technology, AJAX. 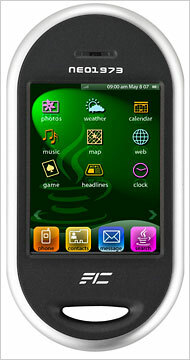 What is more interesting is more interesting to gadget people is perhaps the announcement of JavaFX Mobile, a JavaFX-based middleware application stack for mobile phones. Which was quite ironic since only the annoucement before, Yahoo came up to talk about Yahoo! Go, Yahoo’s platform for mobile applications. And of course, everybody’s favourite search engine, Google was rumoured to join the mobile application fray early next year. The afternoon’s general session was equally interesting. NASA joined in the list of Java partners as they introduced and offered the NASA World Wind technology as a Java SDK, which provides the same global geo-mapping capabilities as Google Maps or the likes, but as a Java SDK. Another point of interest for me is Glassfish version 3. I admit I pooh-poohed the earlier versions of Glassfish as a wannabe, following Apache Genronimo and other open source app servers (and having bad experience in previous versions of the J2SE-linked app servers) but the demo of the new version 3 impressed me. Someone had earlier on demoed how he packaged a Ruby on Rails application (Mephisto) as a war file to be run under Glassfish with JRuby. But in Glassfish version 3, Jerome Doche, the Glassfish lead showed how Mephisto, a PHP app and a war file was deployed side by side with no change to the original code! The few technical sessions I managed to catch (the sessions were very annoyingly arranged such that sessions I was interested in were invertently running concurrently) ranged from eye-opening (Groovy) to humourous (Jason Hunter’s Web Algorithms), obivous (closures in Java) and vaguely cool (Java in Robotics). Groovy excited me quite a bit as it was every bit the scripting language I wanted when I doing Jaccal (I can’t remember why I didn’t go for it), being very interestingly similiar to Ruby in its syntax and capabilities. It even has Groovy on Grails, and I suppose it’s flattering for Ruby on Rails to be copied in such an obivious manner. Closures in Java were maddening — while Neal Grafter from Google was very earnest in introducing the needs and gaps in Java for closures, it was evident to anyone else who knows any other programming language other than Java or C/C++, that closures are incredibly useful and elegant way of coding. In between the sessions, what little time I had I wandered through the Java Pavilion and cruised around for the traditional JavaOne goodies. I got a couple of nice ones — a nifty little ball that flipped colour from yellow to red, and a retro-toy — a slinky. I also caught up with some cool exhibits, like the mobile datacenter in a container from Sun Microsystems (called, what else — the blackbox), a Java-controlled robotic helicopter and a Java-controlled robotic submersible, and interestingly got to know more about Java Card version 3. Apparently in Java Card 3, the draft specifications to be released early next year, Java Card will include a built-in web server (you heard it right), which will serve AJAX-enabled html pages (and probably applications) from the smart card itself. This is from the Gemalto folks from the Sun booth so I probably wasn’t dreaming (or drunk — they had free flow of beer and wine by evening). All in all, today was a very interesting and fruitful day, a head-ful of new technologies and interesting turn of events (I look now at JRuby with renewed interest and Java Card 3 is just plainly mind-boggling) and some neat toys in tow. Can’t wait for tomorrow’s sessions.